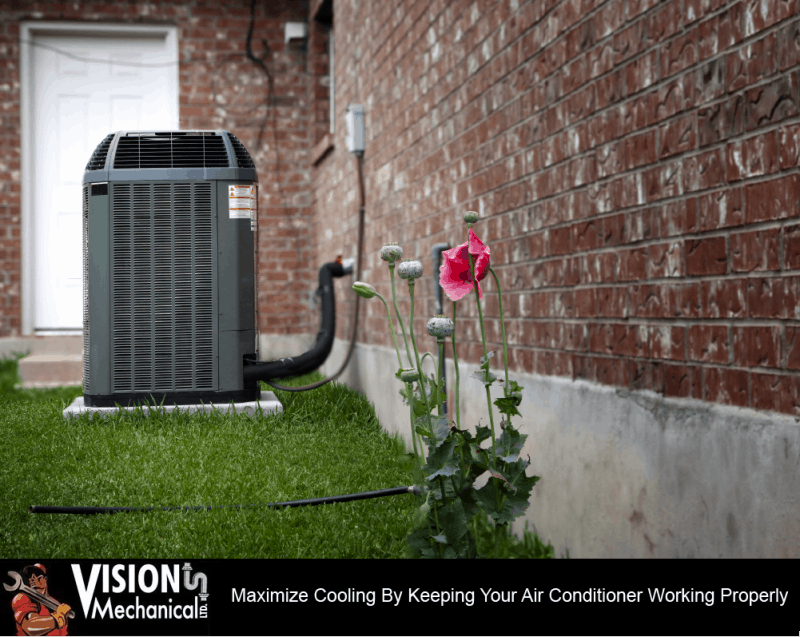 Maximize Cooling By Keeping Your Air Conditioner Working Properly | Vision Mechanical Ltd.
Start by checking the air conditioners filters. Replace any of the dirty and clogged filters with new ones, as a clean filter will reduce energy consumption by 5%-15%. Evaporators and condenser coils collect dirt over the months and years. Often a clean filter will prevent the dirt from getting into the evaporators and condenser coils. Over time there will be some accumulation of dirt and debris to have removed. Dirt reduces airflow and insulates the coil reducing its ability to absorb heat. Make sure to check the coils every year and clean them to increase efficiency in airflow. If you notice the aluminum fills on the coils are bent and is blocking air flow, Vision Mechanical Ltd. can help fix the issue and ensure your air conditioner is in great working condition for the summer. Clogged up drain channels accumulate dirt and debris over time. Occasionally pass a stiff wire through the unit’s drain channels. The issue with clogged drain channels is they prevent a unit from reducing humidity resulting in excess moisture. The condensation may also discolour walls or carpet. This job is best left to the professionals, ensuring it is done correctly and without damage to the air conditioning unit. Properly sealed windows are very important to ensure cool air stays inside. Before the hot weather arrives, make sure to inspect the seal between the air conditioning unit and the window frame is connected properly with the metal case. Frequently check the window seal is intact so your air conditioner is working properly and cool air is not escaping. Over winter, cover your room air conditioner or remove it from the window to store it till next summer. For the outdoor air condition units, covering them during the winter season will protect them from extreme cold, snow, and debris. This will help ensure their working condition come summer, reducing the chances of having to replace your existing air conditioner. Check out Vision Mechanical’s VIP Agreement Program and discover the numerous benefits associated with it. Contact our team of experts today and guarantee your air conditioner is ready to run all summer long.